Uncommon permanent resident and migrant throughout California, except center of Central Valley. Perhaps more common in southern California than in north. Ranges from sea level up to 3833 m (0-11,500 ft) (Grinnell and Miller 1944). Habitat typically rolling foothills, mountain areas, sage-juniper flats, desert. Feeding: Eats mostly lagomorphs and rodents; also takes other mammals, birds, reptiles, and some carrion. Diet most varied in nonbreeding season. Needs open terrain for hunting; grasslands, deserts, savannahs, and early successional stages of forest and shrub habitats. Soars 30-90 m (98-297 ft) above ground in search of prey, or makes low, quartering flights, often 7-8 m (23-26 ft) above ground. Occasionally searches from a perch and flies directly to prey (Carnie 1954). Sometimes pirates food from other predators. Hunting in pairs apparently common. Cover: Secluded cliffs with overhanging ledges and large trees used for cover. Reproduction: Nests on cliffs of all heights and in large trees in open areas. Alternative nest sites are maintained, and old nests are reused. Builds large platform nest, often 3 m (10 ft) across and 1 m (3 ft) high, of sticks, twigs, and greenery. Rugged, open habitats with canyons and escarpments used most frequently for nesting. Water: No data found. Water needs probably met from prey. Pattern: Uses rolling foothills and mountain terrain, wide arid plateaus deeply cut by streams and canyons, open mountain slopes, and cliffs and rock outcrops. Seasonal Movements/Migration: Mostly resident, but may move downslope for winter, or upslope after breeding season. Some migrate into California for winter. Home Range: Home range probably same as territory. Size of home range related to prey density and availability, and openness of terrain. Territory: Territory estimated to average 57 km2 (22 mi2) in Idaho (Beecham and Kocher 1975), 171-192 km² (66-74 mi²) in Montana (McGahan 1968), 23 km² (9 mi²) in Utah (Smith and Murphy 1973), 93 km² (36 mi²) in southern California (Dixon 1937), and 124 km² (48 mi²) in northern California (Smith and Murphy 1973). Reproduction: Breeds from late January through August; peak in March through July. Clutch size 1-3, usually 2. Eggs laid early February to mid-May. Incubation 43-45 days (Beebe 1974), and nestling period usuallv 65-70 days. Niche: Occasionally preys on domestic calves and lambs. May compete with ferruginous hawks for small mammals, and with California condors for carrion. May desert nest in early incubation if disturbed by humans (Thelander 1974). Beebe, F. L. 1974. Field studies of the Falconiformes of British Columbia. Brit. Col. Prov. Mus. Occas. Pap. No. 17. 163pp. Beecham, J. J., and M. N. Kochert. 1975. Breeding biology of the golden eagle in southwestern Idaho. Wilson Bull. 87:506-513. Carnie, S. K. 1954. Food habits of nesting golden eagles in the coast ranges of California. Condor 56:3-12. McGeen, D. S., and J. J. McGeen. 1968. The cowbirds of Otter Lake. Wilson Bull. 80:84-93. Olendorff, R. R. 1976. The Food habits of North American golden eagles. Amer. Midl. Nat. 95:231-3-236. Remsen, J. V., Jr. 1978. Bird species of special concern in California. Calif. Dep. Fish and Game, Sacramento. Wildl. Manage. Admin. Rep. No. 78-1. 54pp. Smith, D. G., and J. R. Murphy. 1973. Breeding ecology of raptors in the eastern Great Basin of Utah. Brigham Young Univ., Provo. Sci. Bull. Biol. Ser. 18, No. 3. 76pp. Thelander, C. G. 1974. Nesting territory utilization by golden eagles (Aquila chrysaetos) in California during 1974. Calif. Dept. Fish and Game, Sacramento. Wildl. Manage. Branch Admin. Rep. 74-7. 19pp.ican rough-legged hawk. Pages 269-284 in A. C. Bent. Life histories of North American birds of prey. Part 1. U.S.
Natl. Mus. Bull. No. 167. 409pp. Udvardy, M. D. F. 1977. The Audubon Society field guide to North American birds: western region. A. Knopf, New York. 855pp. Zarn, M. 1975. Rough-legged hauk, Buteo lagopus sanctijohannis. U.S. Dep. Inter., Bur. Land Manage., Wash. DC. Tech. Note No. 270. 23pp. The Golden Eagle (Aquila chrysaetos) is named for the golden-colored feathers on the crown and neck. The 8-12 pound body is usually colored dark brown with a dark tipped tail and has a wing span from 6-7 feet. 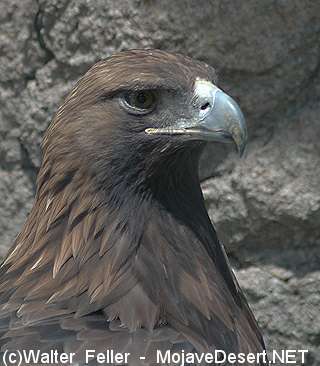 The Golden Eagle feeds mainly on ground squirrels, rabbits, and birds. They also feed on carrion. The Golden Eagle is a raptor.